The term “MacPherson strut” can refer to both a type of strut and the suspension systems that use them. This type of suspension system uses a single component (the eponymous MacPherson strut) to replace two components that were present in earlier systems: a suspension mount for a wheel and a pivot for the steering. Earlier systems had typically used a spring, shock absorber, or other component for the suspension requirement and a component like a kingpin to serve as the steering pivot. This simplification results in MacPherson strut systems being less expensive to produce than other systems, although there are also some drawbacks. MacPherson struts have been popular for decades. 2 How Does a MacPherson Strut Suspension Work? 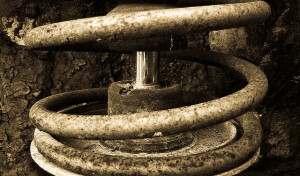 The history of the MacPherson strut can be traced back to an earlier system that was originally used by Fiat. This system, which dates to the 1920s, and another similar leaf spring-based design that was employed by French automaker Cottin-Desgouttes, are early examples of designs that unified the steering pivot and suspension into a single component. Building on these earlier ideas, Earle MacPherson first began to develop his own system that utilized a unified coil spring and shock aborber assembly in the 1940s. His initial work on this new type of suspension system was done while he was working at General Motors, where he was the head engineer of their “light car” project. The idea was to engineer a car that was lighter, more manueverable, and cheaper than anything on the market, and MacPherson’s suspension system was instrumental in that design. However, General Motors ended up canning the project before it could come to fruition. Earle MacPherson is credited in Ford’s 1949 patent application. After General Motors discontinued its light car project, MacPherson left the company and went to work with Ford. He took his ideas with him, and in 1949, Ford was granted a patent (for which MacPherson received credit as the inventor) for MacPherson’s design. 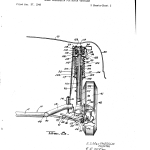 This patent specified that the anti-roll bar doubles as a tension rod. This system first appeared on ythe Ford Vedette for the 1949 model year, and other Fords (in England and France) also used it in the 1950s and 1960s. However, a number of factors conspired to prevent the immediate, widespread adoption of this technology. When unibody construction started to gain popularity in the 1960s, automakers took a second look at the MacPherson strut suspension. Due to the way that MacPherson strut suspensions are set up, they are better suited to monocoque designs, which unibody is a modified form of. This is due to the fact that the top mounting point of each strut needs to be located significantly higher than the frame in body-on-frame construction. Since the entire body of the vehicle provides structural support in monocoque construction, the widespread adoption of t’he unibody also resulted in a widespread adoption of MacPherson strut suspension systems. Although modern MacPherson struts still bear Earle MacPherson’s name, most of them don’t fall under the aegis of his patent. This is due to the fact that automakers typically utilize an a-arm for a lower control arm, which effectively removes the need for an anti-roll bar/tension rod. How Does a MacPherson Strut Suspension Work? Components of a MacPherson strut suspension system. MacPherson strut suspension systems typically utilize either a steering knuckle or a hub carrier that has two mounting points that attach it to the body of the vehicle. The lower mounting point attaches to a track control arm or lower control arm, and it is this connection that dictates both the longitudinal and lateral orientation of the wheel assembly. 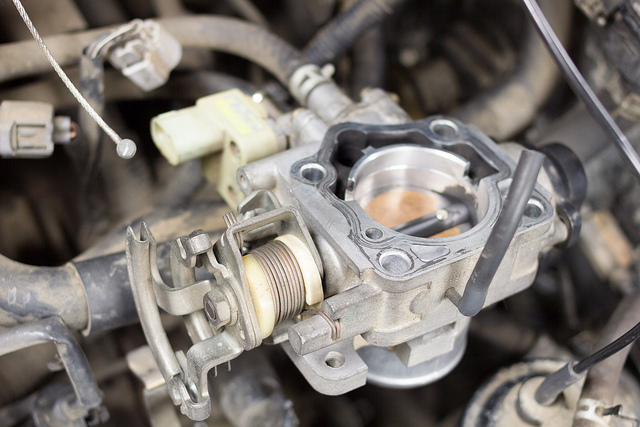 In turn, the upper mounting point of the knuckle or hub is attached in some way to an assembly that contains a coil spring and a shock absorber. 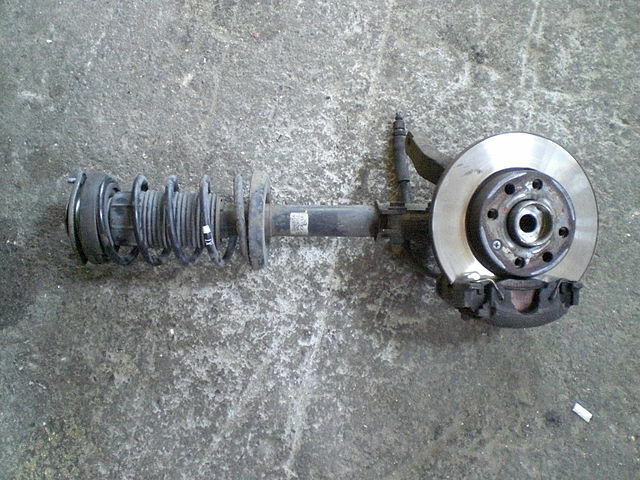 It is this combination of housing, spring, and dampener that is referred to as a strut or, more properly, as a MacPherson Strut. 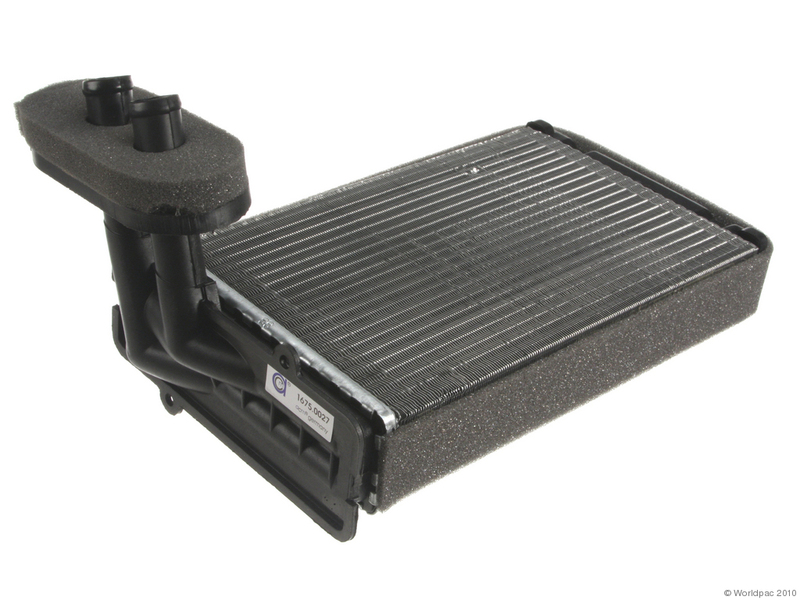 It typically extends upward into the unibody shell and bolts to a location that is referred to as a strut tower. The other main defining factor in a MacPherson strut suspension is the way that the axis of the strut itself also serves as the upper steering pivot (the lower pivot is the mounting point between the knuckle and control or track arm.) This upper pivot point is attached to a tie rod end that, in turn, is attached to the steering gear. The main advantages of MacPherson struts are related to the relative simplicity of these systems. Since the upper control arm is entirely eliminated, MacPherson strut suspensions require less components, which means that they are less expensive to produce than other types of suspension systems. This simplicity also means that they take up less space, which is a huge benefit for smaller vehicles. Since less space is taken up to either side of the engine compartment, there is more room for the engine and other components. The simplicity of MacPherson strut suspensions means that the entire assembly, hub, rotor, and brake caliper included, can be removed as a single unit. 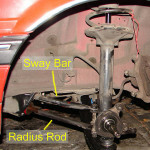 The other main issue with MacPherson struts is related to the way that the mount to the body of vehicles. Since the top of the strut is typically mounted high up in a strut tower, and its axis extends straight down to the wheel, vibrations from the wheel are transmitted directly into the body of the vehicle. That can result in excessive road noise and vibration, which is mitigated somewhat by bushings and other components and mechanisms. Since the strut in a MacPherson strut system is an integral part of both the steering and suspension systems, a failure can be catastrophic. If a failure occurs at the tie rod end mounting point, or at the control arm mounting point, the tire may pivot at an angle and cause the driver to lose control. In some cases, the vehicle may even roll. Failures like these are typically the result of manufacturing defects or impact damage rather than worn out or poorly maintained parts. Most MacPherson strut failures are related to the dampener wearing out, which happens at regular intervals. In most cases, this type of failure can be repaired by removing the strut assembly, releasing the spring tension with a special compressor tool, and replacing the shock absorber cartridge. This is often a simple bolt-on procedure, but some strut assemblies must be carefully aligned afterwards to ensure proper camber and caster settings. Excellent account of the working and repair of the McP suspension. My ’88 Volvo got damaged in a side impact collision, so not only had to replace the strut, but also re-align the strut tower, which got pushed in by one inch. This required the application of 2 tons of sideways force to the strut mounting studs, using a “come-along” type block and tackle anchored to the wall of my house. The alignment was perfectly restored and car is still in use with 380,000 km. Next story What is a Transmission? 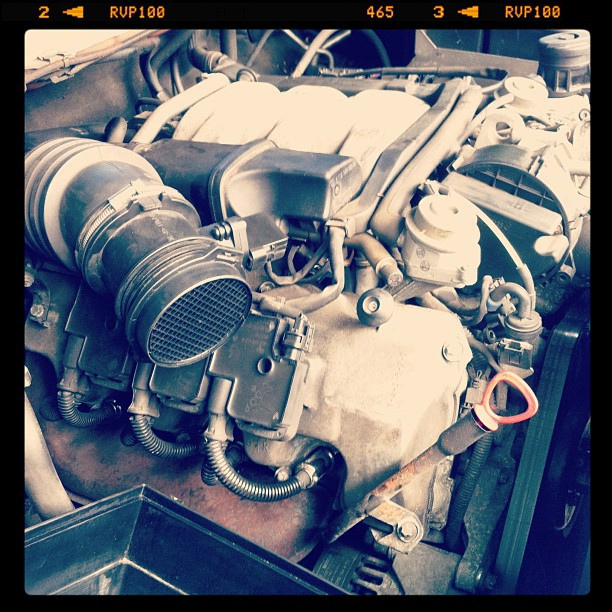 Previous story What is a Water Pump?